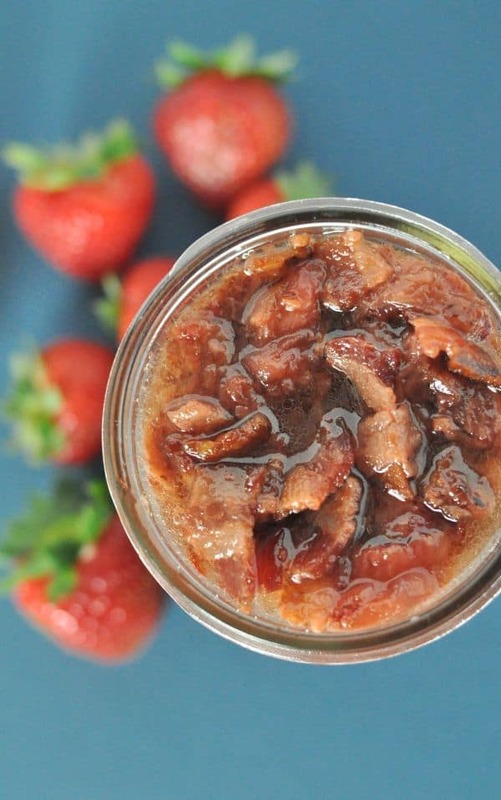 Simple strawberry bacon jam, sweet and savory and perfect for burgers or serving with an appetizer or as a sauce. Earlier this summer I had a five-alarm fire at my house. Yes, five fire engines showed up. I had a grease fire in the bottom of my oven and I took my fire extinguisher and blasted that baby out. But my heroic moment of blasting the fire out also created a messy operation and the fire damaged my oven so I stewed about what to do. For two months. Yeah. I had picked out a new oven and everything. Then I had a repairman over to check out my dishwasher and I asked if he had a second to check out the oven. An hour later I was back in business. The summer is so hot I was actually fine without an oven, well except for baking bacon. 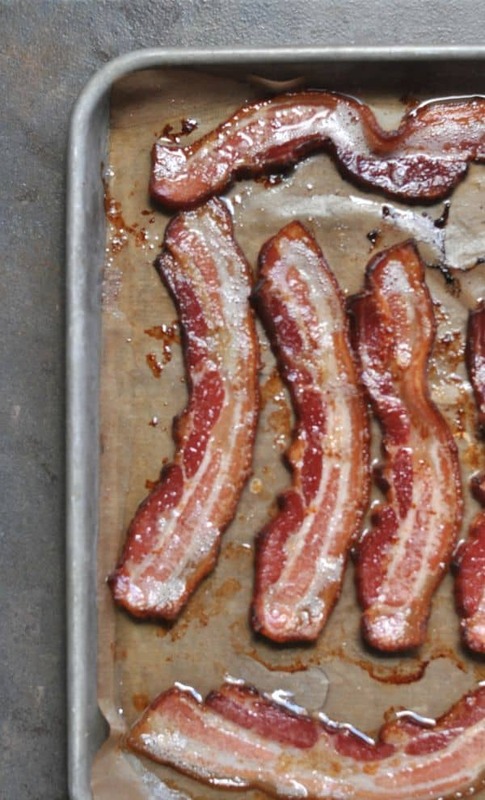 Why yes, I bake my bacon. Actually I broil it and it is the most amazing thing in the world. Perfectly flat and crispy. 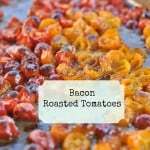 Now that I was back broiling bacon, I started using it for everything including Roasted Tomatoes. 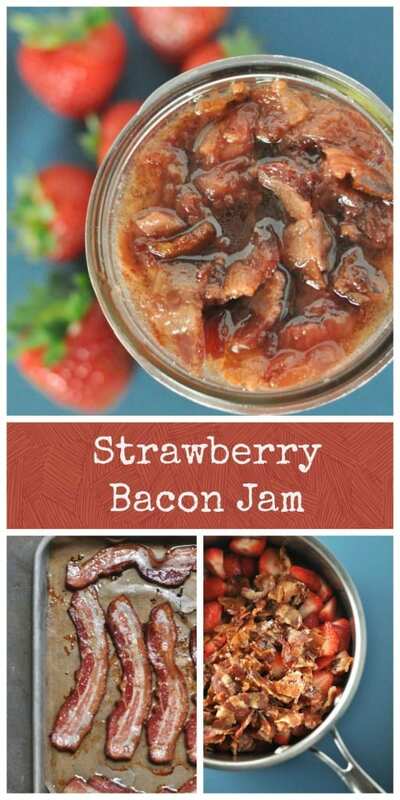 I was working on a new Peanut Butter Burger recipe and I thought you know jam would go perfect, but what would happen if I combined bacon and strawberries and made Strawberry Bacon Jam? So I got to work. 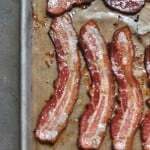 First, I broiled the bacon, for information on how to do that, check out my post on Candied Bacon (broiled bacon with brown sugar). Add it to strawberries with brown sugar and let it cook down. 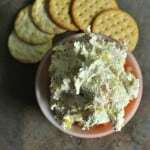 I let it cool overnight and it was ready for topping on burgers, topping goat cheese for an easy appetizer or eating out of the jar with a spoon. Wait, who said that? Okay, I might have taken a bite out of the jar. Guilty. Once cooled, the jam with have pockets of fat, you can dig around and remove them or just lightly heat the jam before serving. Your Peanut Butter and Jelly will never be the same. In a medium saucepan, over low heat, combine ingredients and cook for 20 minutes. Remove from heat and let cool overnight. Makes 1 pint of jam. 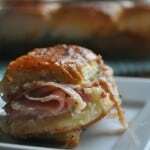 Keep refrigerated and use within two weeks. Fat will settle once cooled. Reheat if desired. 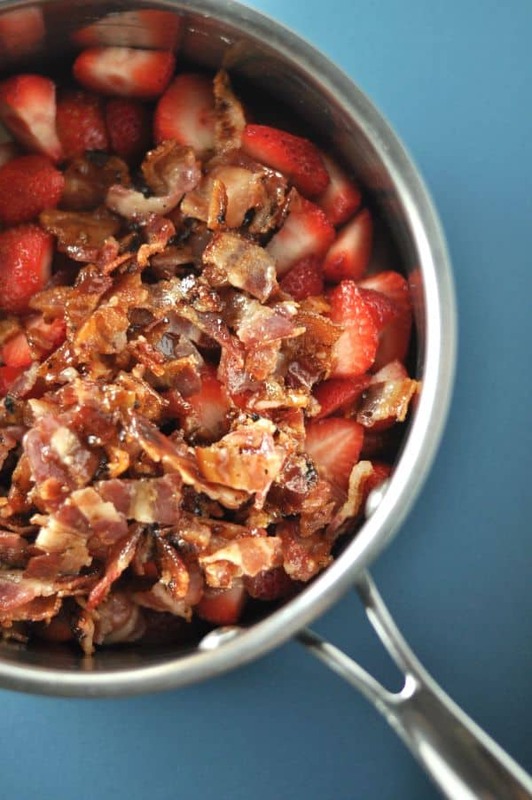 I recommend using my Candied Bacon recipe for the bacon in the jam. 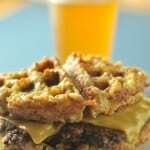 Serve this on my Peanut Butter Burgers. 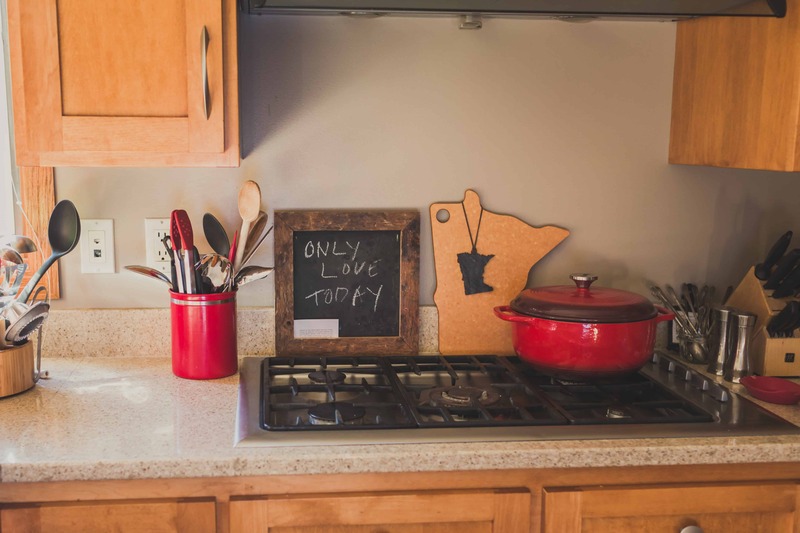 This entry was posted in Appetizers and tagged appetizers, bacon, burgers, comfort food, kids by Alice Seuffert. Bookmark the permalink. This sounds amazing! 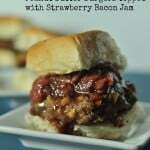 Do you know if this recipe is able to be canned like other jams and jellies?